Earth Day is happening this Sunday, on 22nd April. And it is a day whereby events are held worldwide to increase awareness and appreciation of the Earth's natural environment. 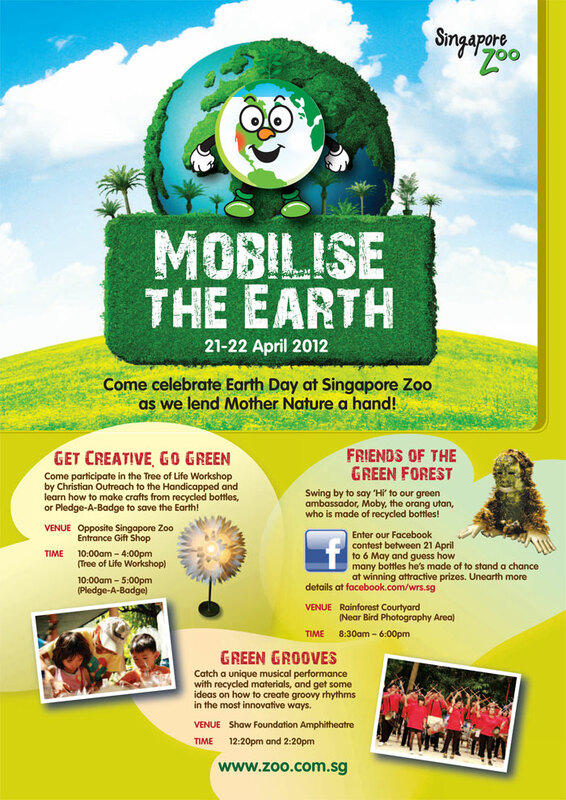 And so this weekend, expect a host of Earth Day related activities for the young and old! 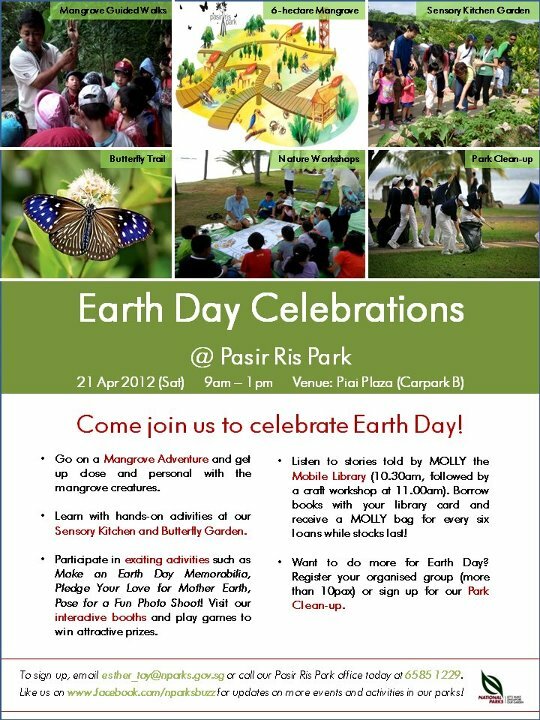 Join in the celebrations of Earth Day at Pasir Ris Park (Piai Plaza - Carpark B) on 21st April, 9am to 1pm. Go on a Mangrove Adventure and see creatures of the mangrove forest. Explore and learn with hands-on activities at the Sensory Kitchen Garden and Butterfly Trail. Participate in Nature Workshops and many other exciting activities, and stand to win attractive prizes too! 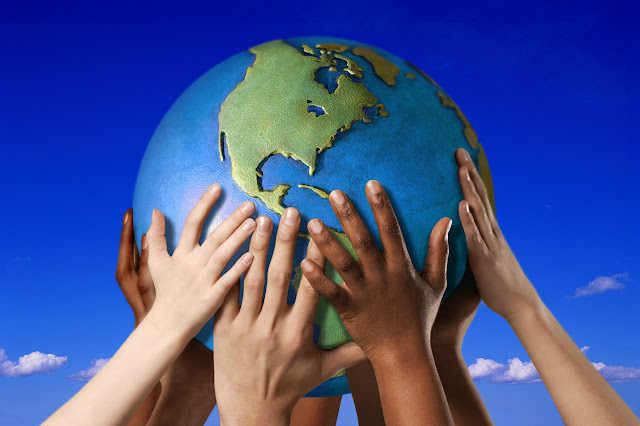 Want to do more for Earth Day? Register your organised group (more than 10 persons) and sign up for the Park Clean-up. Activities are free of charge. 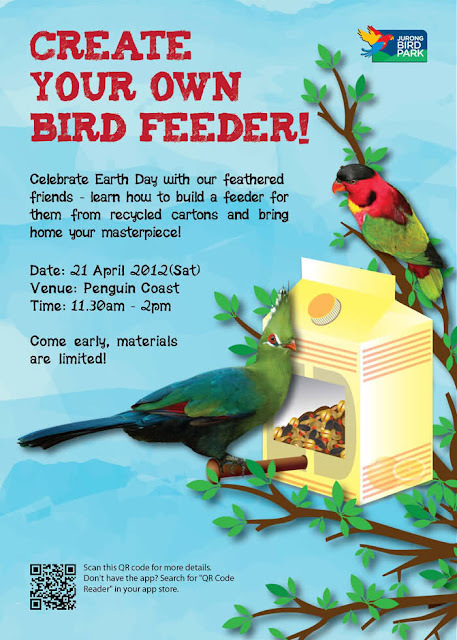 Golden Village will be organizing the first Eco-Vegan fair in Singapore, on Saturday, 21st April, at GV Yishun, 12 to 9pm. It will feature an array of eco-friendly products from brands such as Pachelbel, Sparks & Posh, Wish List, Etrican, All Things Green and Beautiful, O Right and After Organics. There will also be stalls offering vegan food & beverages like Soyato Ice Cream and Veg Fry. There will also be a sculpting booth at the fair as well as a recycling machine that has already made its home in GV Yishun, encouraging patrons to lend their hand in saving the environment. Power 98 DJS will be there as well, giving away free movie tickets while engaging in activities with visitors. For enquiry and registration, please contact the SBG Education Branch at 6471 9961/6465 0196 or email: nparks_sbg_edu@nparks.gov.sg. Online registration is available on www.sbg.org.sg (under "Education"). In order to raise consumer awareness about the extent and impact of litter in the marine environment, the International Coastal Cleanup Singapore Coordinators have initiated a programme of Year-Round Coastal Cleanup. And as part of Earth Day celebrations, this second year-round coastal cleanup will be held at Tanah Merah, as marine life there is still fighting the effects of the 2010 oil spill.